WARSAW, Poland - Polish archeologists believe they have located the grave of 16th-century astronomer and solar-system proponent Nicolaus Copernicus in a Polish church, one of the scientists announced Thursday. Copernicus, who died in 1543 at 70 after challenging the ancient belief that the sun revolved around the earth, was buried at the Roman Catholic cathedral in the city of Frombork, 180 miles north of the capital, Warsaw. Jerzy Gassowski, head of an archaeology and anthropology institute in Pultusk, central Poland, said his four-member team found what appears to be the skull of the Polish astronomer and clergyman in August, after a one-year search of tombs under the church floor. "We can be almost 100 percent sure this is Copernicus," Gassowski told The Associated Press by phone after making the announcement during a meeting of scientists. Gassowski said police forensic experts used the skull to reconstruct a face that closely resembled the features — including a broken nose and scar above the left eye — on a Copernicus self-portrait. The experts also determined the skull belonged to a man who died at about age 70. The grave was in bad condition and not all remains were found, Gassowski said, adding that his team will try to find relatives of Copernicus to do more accurate DNA identification. Was this helpful to you? Would you like to see more on this subject? National Catholic Register: Is hospice movement going beyond end-of-life care? 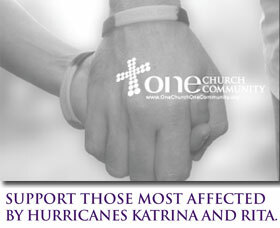 Hurricanes Katrina and Rita destroyed churches, damaged schools, and devastated communities. The task of rebuilding entire cities is monumental, but you can help. Through One Church One Community, millions of fellow Catholics are invited to join in a sweeping concert of prayer. Making this simple but meaningful commitment. Join our Catholic community in prayer. © 2006 Roman Catholic Diocese of Baton Rouge. Copyright © 2006 Catholic Online. All Rights Reserved.